Creating drawings of an existing structure, based on field measurements of the same structure. The structure could be a building, house, individual apartment, stadium, or etc. The goal of such drawings is to document the as-constructed geometry of the structure. I provide as-built services to different clients on a regular basis. It is the bulk of my work. Typically I’ll do so for residential spaces, commercial spaces, and occasionally outdoors spaces like parks or boardwalks. Today in this blog post I’ll summarize one of the projects on which I’ve provided such services. The scope of the project was to rehabilitate a tiny run-down residential house, which is located here in New York City. I created as-is floor plan drawings of this house two weeks ago. It was a fun little project, and over the years I’ve done a number of projects similar to it. While doing the work I even captured some video footage with my point and shoot digital camera. The homeowner gave me permission to post the video here on my blog, so I did so below. Hopefully any prospective clients who come across this post will find it to be a helpful aide in becoming a tad familiar with me and my work. Please be aware that the data listed below is approximate. Type and Location: Residential house located in the Queens, NY. 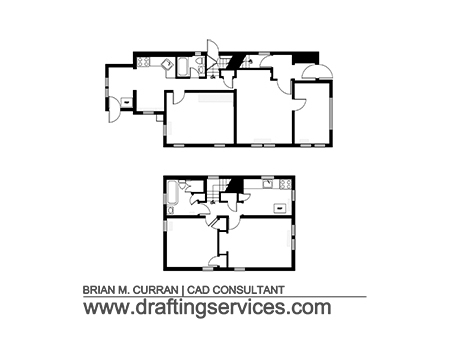 Scope: Create basic floor plan drawings of the first floor and second floor. Area: First Floor = 782 sq.ft. and Second Floor = 520 sq.ft. Comments: This house had a very dense layout. That means there were many walls, nooks and crannies per square foot. It was essentially the polar opposite of a wide open warehouse space. This just means that it took more time to measure and draft. The first and second floor as-is floor plans.